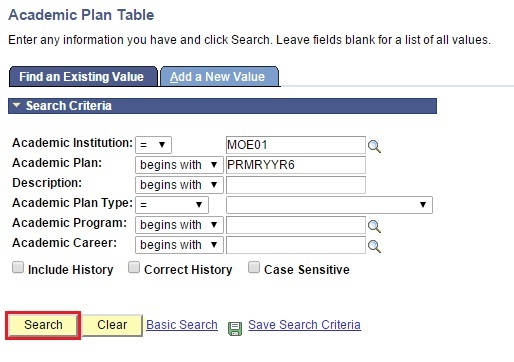 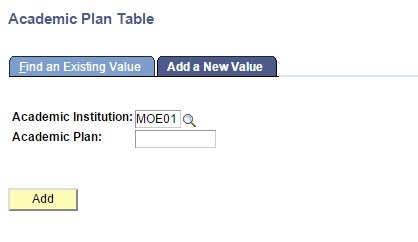 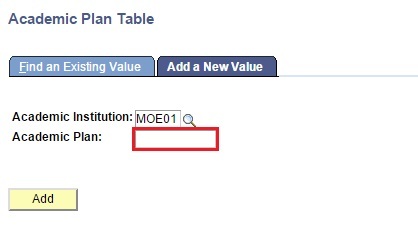 User will be directed to Academic Plan Table search page. 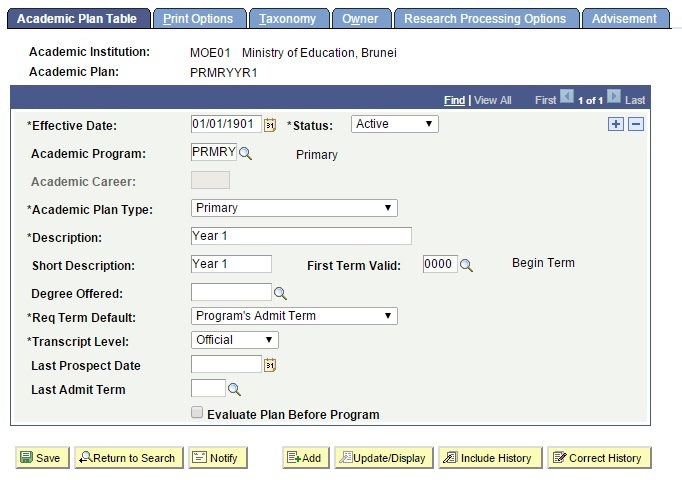 Enter the Academic plan field. 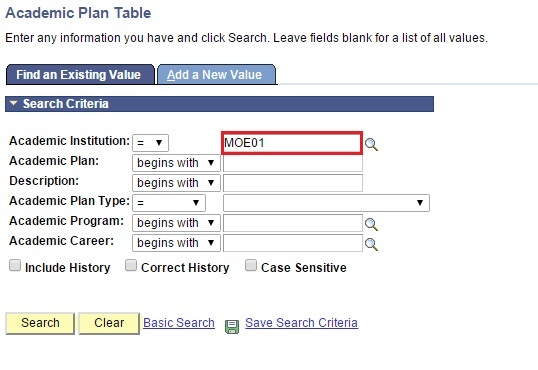 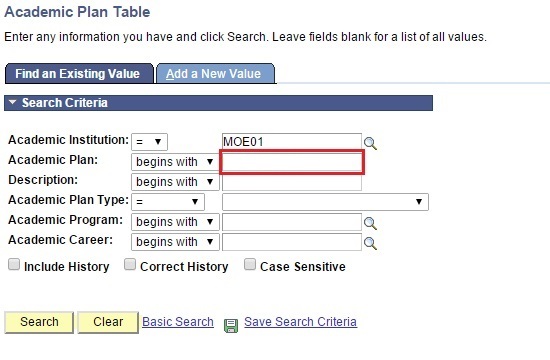 User will be directed to the Academic Program Table search page. 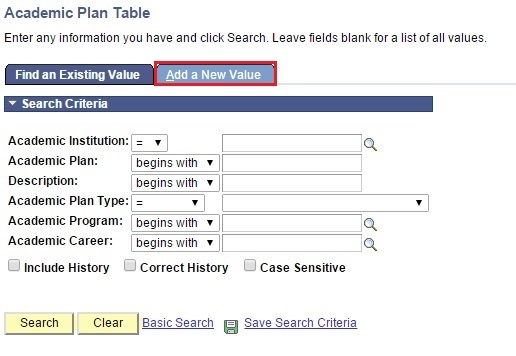 User will be navigated to the Add a New Value tab. 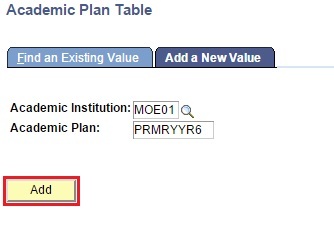 User will be directed to Academic Plan Table page. 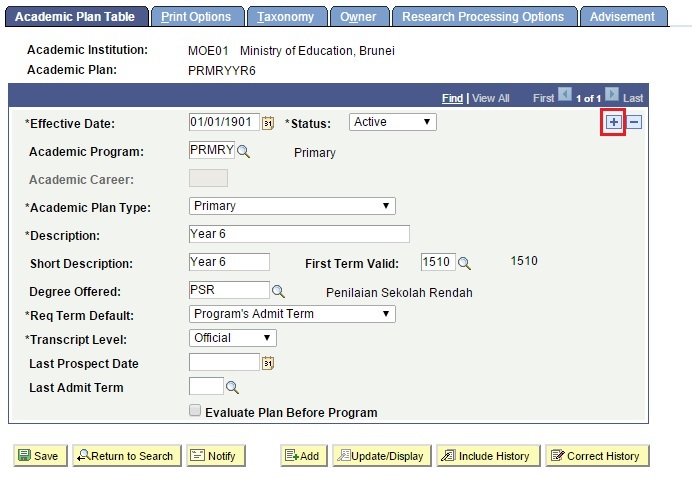 Click on the lookup button and select the Academic Program. 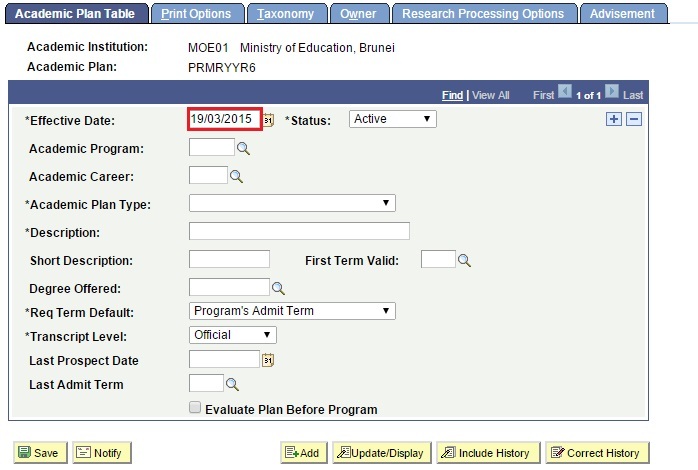 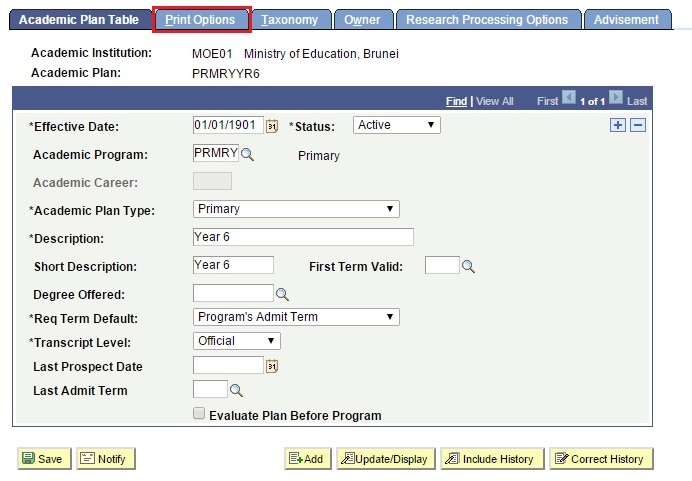 Click on the drop down menu and select the Academic Plan Type. 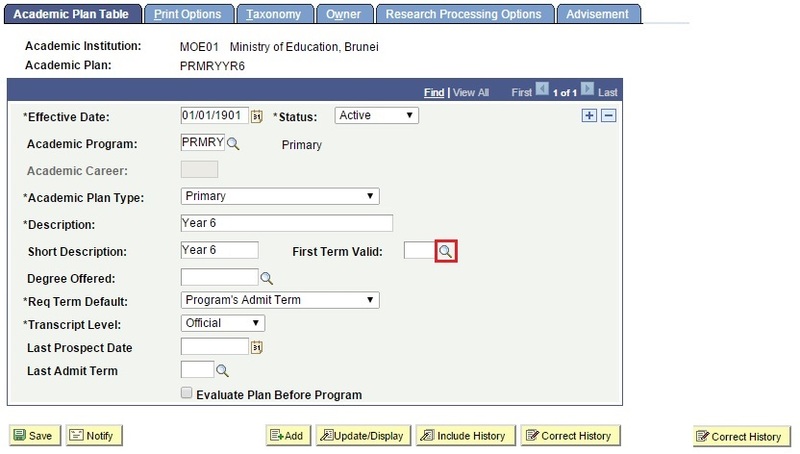 Enter the Description of the academic plan. 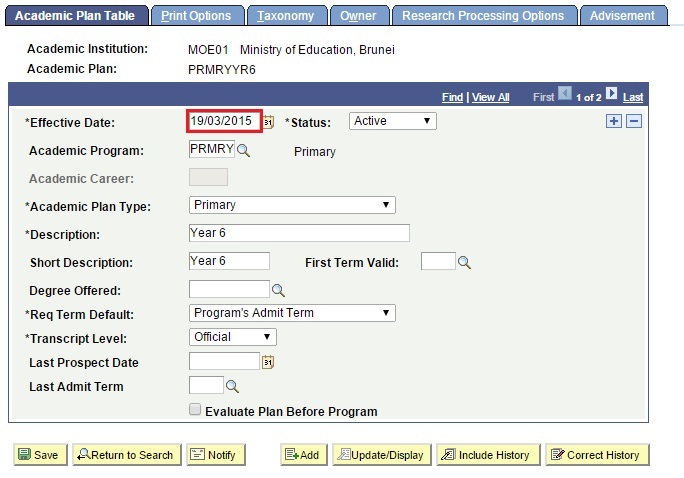 Enter the Short Description of the academic plan. 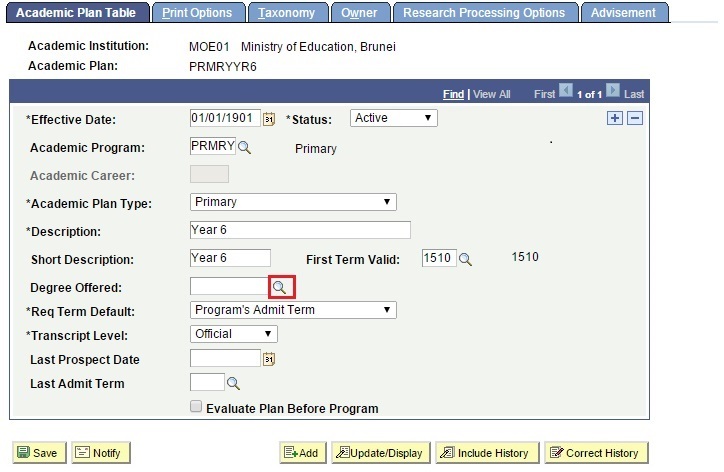 Click on the lookup button and select the First Term Valid when the academic plan will begin. 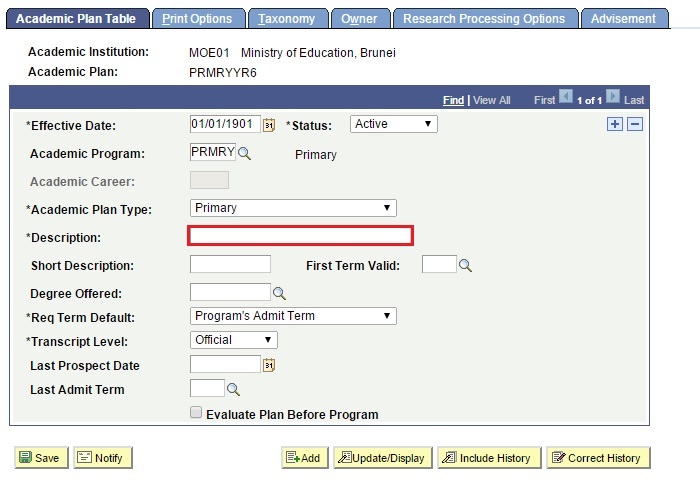 Click on the lookup button and select the Degree Offered if a certificate is given for the academic plan. 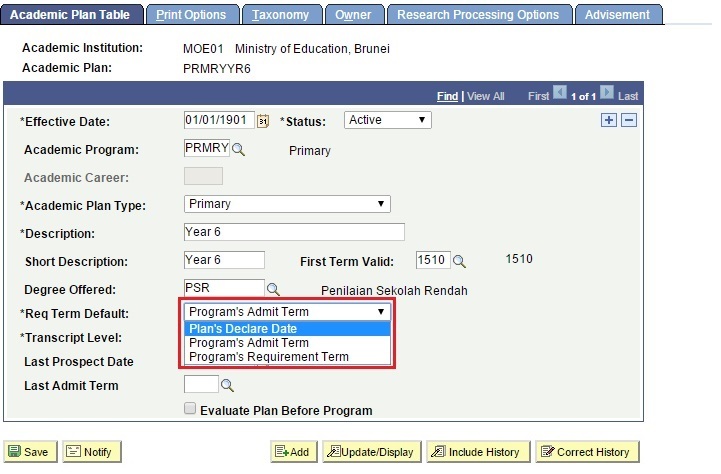 Click on the drop down menu and select the Req Term Default as Program’s Admit Term. 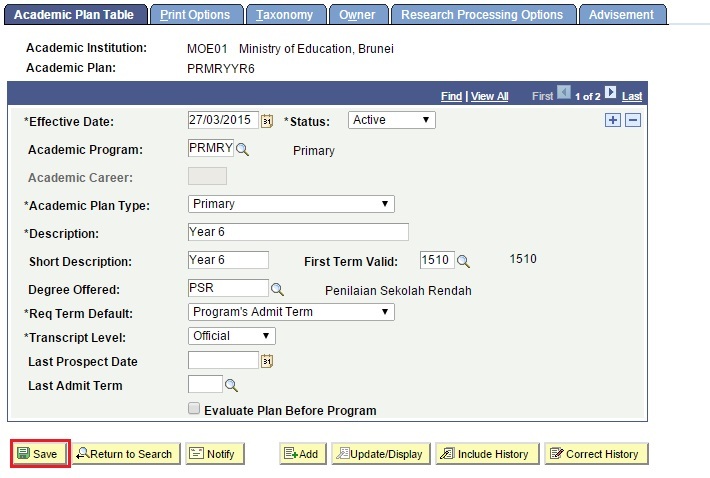 Click on the drop down menu and select the Transcript Level as Official. 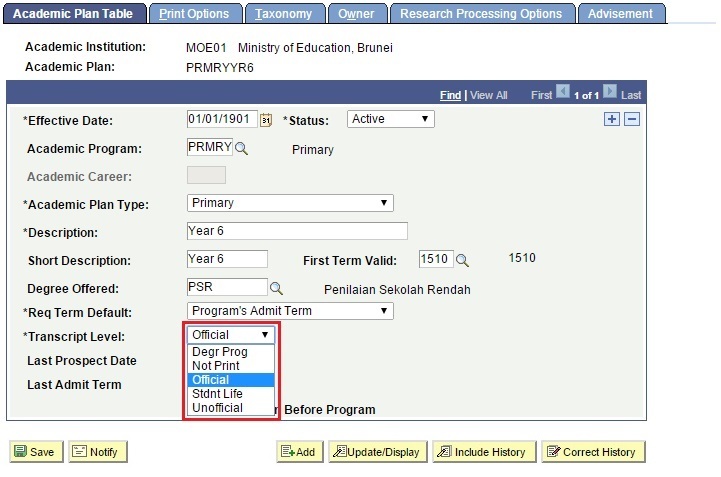 Click on Print Options tab. 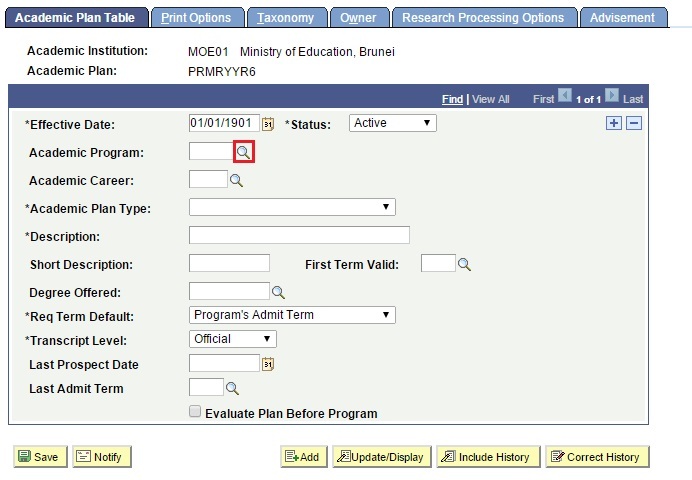 User will be directed to Print Options tab. 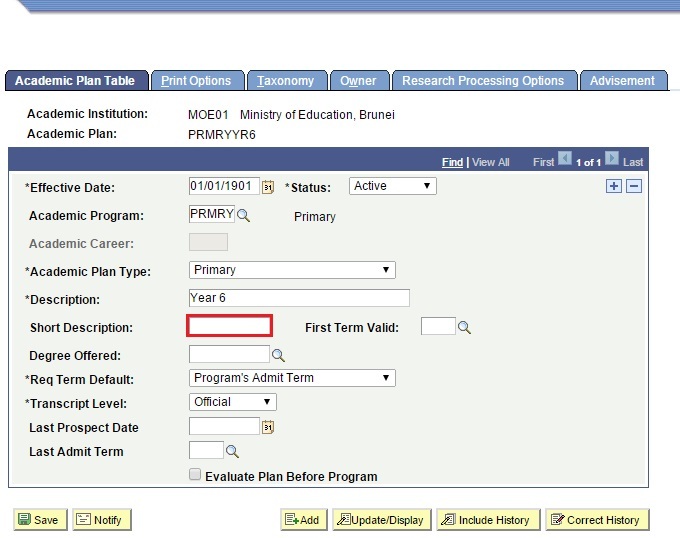 Tick Diploma if academic plan awards official diploma certificate or Transcript if academic plan awards official certificate. 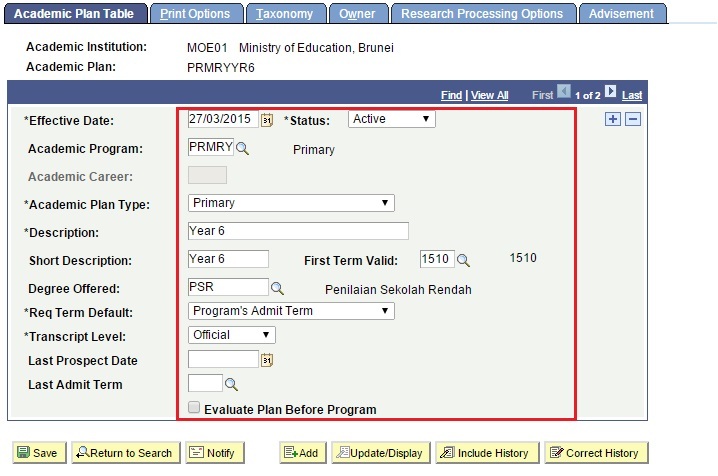 Tick both Diploma & Transcript if academic plan awards both. 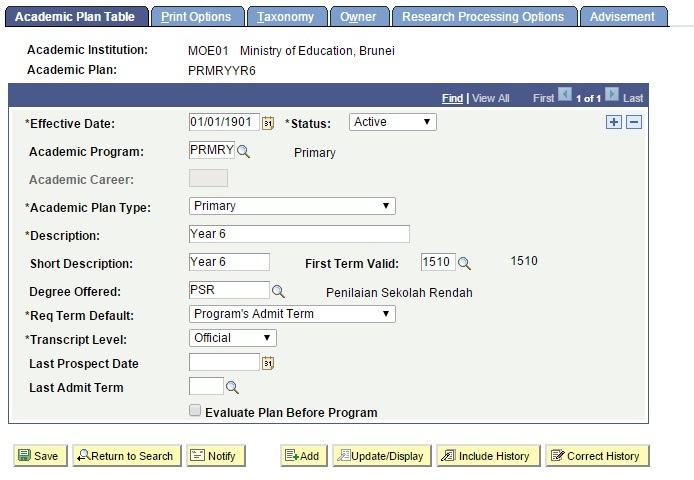 Enter the Transcript Description which is the name of the certificate. 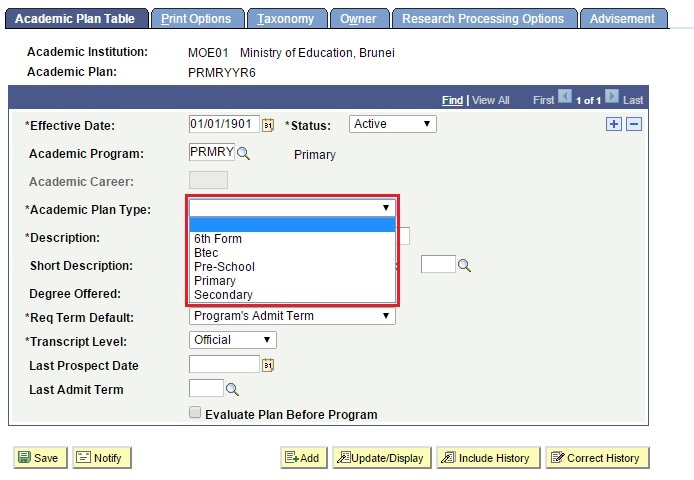 Click on the lookup button and select the Academic Organization which is the Department in Ministry of Education in charge of the academic program. 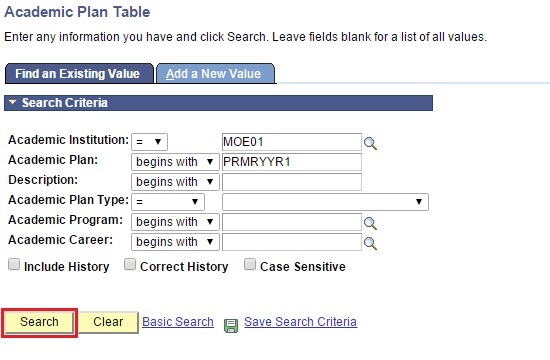 Click on Save to save the record. User will be navigated to Academic plan page.